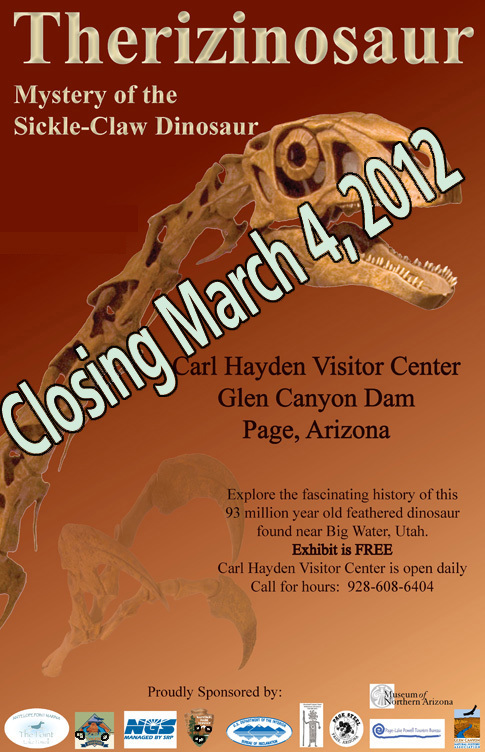 Therizinosaur, Mystery of the Sickle-Claw Dinosaur - that's the name of a exhibit underway at Carl Hayden Visitor Center in Glen Canyon National Recreation Area. The visitor center is adjacent to the dam at the bottom of Lake Powell. The exhibit runs through March 4. It provides an opportunity to explore the fascinating history of the 91 million year old featured dinosaur, which was found near Big Water, Utah. The exhibit is free. The visitor center is open daily. More information. The Federal Bureau of Land Management is looking for volunteers to help count raptors in Utah. As part of the annual Raptor Inventory Survey in northern Utah, volunteers will spent two field days per month March though July in a specific monitoring areas. Volunteers need to have binoculars, a GPS unit and an email address. Experience is not required. See this website or call 801-977-4300 for more information.